Connect to the daily class schedule and purchase class passes right from your phone or tablet. Find always up-to-date schedules and class descriptions on our App. Set to an energizing playlist, this all levels class strengthens, balances and tones your entire body and mind. Amazing Flow class inspired by hip-hop. The beats are fun and the energy is electric. This is a classic all levels Amazing Yoga class led by one of the Amazing Yoga teachers in training. 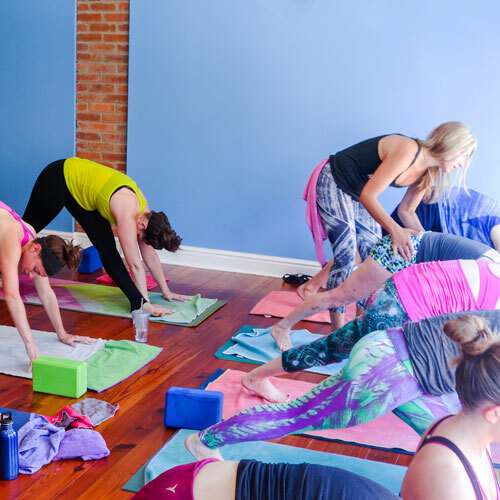 A flowing class focusing on more basic poses and alignment. This class is perfect for anyone who wants to be challenged, brand new students or those with experience looking to hone their precision. Be prepared to sweat and have fun! Yin Yoga involves a relaxed practice of floor postures that are held from three to five minutes at a time. The postures encourage the slow and safe opening of connective tissues, leaving you with an overall feeling of lightness, spaciousness and peace. Our Yin Yoga classes are a perfect complement to our more active Power Yoga classes. Find out about upcoming workshops, events, and news.